A study by SME card payment services firm Paymentsense has shown a positive correlation between bring your own device (BYOD) schemes and increased cyber -security risk in SMEs. Bring your own device (BYOD) schemes / policies have now become commonplace in many businesses, with the BYOD and enterprise mobility market size growing from USD $35.10 Billion in 2016 to USD $73.30 Billion by 2021 (marketsandmarkets.com). BYOD policies allow employees to bring in their personally owned laptops, tablets, and smart-phones and use them to access company information and applications, and solve work problems. This type of policy has also fuelled a rise in ‘stealth IT’ where employees go outside of IT and set up their own infrastructure, without organizational approval or oversight, and can, therefore, unintentionally put corporate data and service continuity at risk. The Paymentsense study, involving more than 500 SMEs polled in the UK found a positive correlation between the introduction of a BYOD policy and cyber-security incidents. For example, 61% of the SME’s said that they had experienced a cyber-security incident since introducing a BYOD policy. According to the study, although only 14% of micro-businesses (up to 10 staff) reported a cyber-security incident since implementing BYOD, the figure rises to 70% for businesses of 11 to 50 people, and to 94% for SMEs with 101 to 250 employees. The study showed that the most popular types of security incidents in the last 12 months were malware, which affected two-thirds (65%) of SMEs, viruses (42%), DDoS distributed denial of service (26%), data theft (24%), and phishing (23%). The focus of the report was essentially the security risks posed by BYOD. There are, however, some very positive reasons for introducing a BYOD policy in the workplace. These include convenience, cost saving (company devices and training), harnessing the skills of tech-savvy employees, perhaps finding new, better and faster ways of getting work done, improved morale and employee satisfaction, and productivity gains. Many of these benefits are, however, inward-focused i.e. on the company and its staff, rather than the wider damage that could be caused to the lives of data breach victims or to the company’s reputation and profits if a serious security incident occurred. 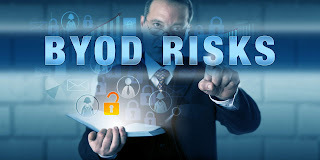 This is a reminder that, as well as the benefits of BYOD to the business, if you allow employees or other users to connect their own devices to your network, you will be increasing the range of security risks that you face. This is particularly relevant with the introduction of GDPR last Friday. For example, devices belonging to employees but containing personal data could be stolen in a break-in or lost while away from the office. This could lead to a costly and public data breach. Also, allowing untrusted personal devices to connect to SME networks or using work devices on untrusted networks outside the office can put personal data at risk. Ideally, businesses should ensure that ensure that personal data is either not on the device in the first place, or has been appropriately secured so that it cannot be accessed in the event of loss or theft e.g. by using good access control systems and encryption. Businesses owners could reduce the BYOD risk by creating and communicating clear guidelines to staff about best security practices in their daily activities, in and out of the office. Also, it is important to have regular communication with staff at all levels about security, and having an incident response plan / disaster recovery plan in place can help to clarify responsibilities and ensure that timely action is taken to deal with situations correctly if mistakes are made.